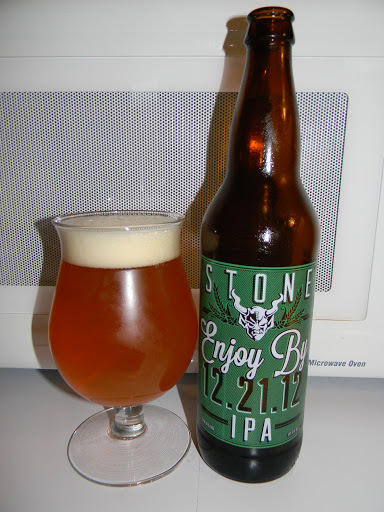 Stone | Beer Apprentice - Craft Beer News, Reviews, Interviews and Info. What’s up guys? For today’s craft beer review I’m going to be trying one of the most talked about beers of the last few months. It’s the RuinTen IPA produced by the Stone Brewing Company located in Escondido, California. From the website, stonebrew.com, I copied this bit of info about the brew. Alright. Let’s crack this thing open and see how it is. This brew came in a 22 oz. bottle with an ABV of 10.8%. It poured a stunning orange color with an off white head that was smooth and mostly creamy with some tightly compacted bubbles. The size was good and the retention time was solid. The lacing was just “ok”, yet it had some very attractive alcohol legs sticking to sides of the tulip. Also, once it warmed the chill haze disappeared and it cleared up very nicely. Hops abound in the nose. Juicy tones of grapefruit, orange, pineapple and tangerine. It also presented a very noticeable alcohol tone. Just a very, very small amount of caramel and bready malts were discovered hidden underneath the hops. Definitely not enough to overtake the strong, resiny hop profile. The taste dispersed a tremendous explosion of sticky, resiny hops. Tropical fruits of pineapple and grapefruit. It seemed to have more of an alcohol presence in the taste than it did in the nose (and it was strong in the nose to begin with). It was very bitter and one dimensional. Which was to be expected I guess. The mouthfeel was medium to almost medium/full bodied. Chewy, sticky, smooth and very dry. A tremendous of amount of warmth was felt from the alcohol. Actually, it burned a bit. The carbonation was medium to low, however a ton of flavor was left behind after each sip. Well. No doubt about it. This beer is good. I’d never turn it down and I’ll buy it again I’m sure, but it’s a big and powerful beer. Maybe it’s just me, but I prefer the plain ol’ IPA to this DIPA. The IPA is just a little easier to drink and it doesn’t seem to fatigue my palate the way this beer did. This beverage didn’t seem to have the greatest drinkability I didn’t think. I believe that, for me, it would be best consumed or suited in small samples. I don’t like struggling to drink a beer and I kind of did with this one. As I got toward the final 1/3 of the bottle I was exhausted and done. Either way, the Stone RuinTen IPA is still a great beer and one that I would suggest trying if you are a hop head and can obtain a bottle. Be sure to let me know what you think of it if you’ve already sampled it. I’d love to hear another opinion. Hi guys. 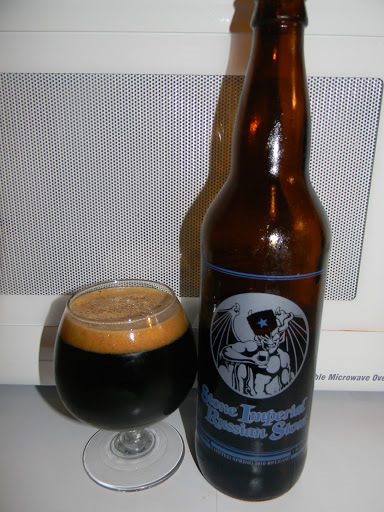 For today’s craft beer review I’m going to be trying a 2010 Stone Imperial Russian Stout produced by the Stone Brewing Company located in Escondido, California. I try to pick this up every year and it just so happened that I had a 2010 put back to try at a later date. Well, now seemed like as good a time as any to drink it. From the website, stonebrew.com, we find this bit of info regarding this classic Imperial Russian Stout. Brewed in the authentic historical style of an Imperial Russian Stout, this beer is massive. Intensely aromatic (notes of anise, black currants, coffee, roastiness and alcohol) and heavy on the palate, this brew goes where few can – and fewer dare even try. The style originated from Czarist Russia’s demand for ever thicker English stouts. Expect our version of this mysterious brew to pour like Siberian crude and taste even heavier! This one comes in a 22 oz. bottle and it has an ABV of 10.5%. It poured black with a khaki colored head that had a decent girth. The texture was smooth and creamy. It left behind some solid lacing and a good deal of clear alcohol was left clinging to the sides of the snifter. After the brew warmed, it was just a black liquid with nary a hint of foam. The nose released tons of roasted malt. Some charred/burnt grains and breads as well as a bit of licorice and coffee. Small touches of chocolate and just a smidgen of dark fruit as well. The alcohol was barely noticed. It had definitely subsided somewhat with the few years of age. The taste brought forth more of the roasted/burnt grains and malt. Literally no booze was found. It had really mellowed and had become way more harmonious than it was when fresh. The dark fruits, chocolate, coffee and licorice have become very well balanced, “round” and a lot more pleasing in my opinion. The mouthfeel was medium/full to mostly full bodied. Dry, chewy and smooth. It still had a very nice amount of carbonation left too. Just a light dab of warmth was felt and a satisfactory amount of flavor was deposited on the palate after each sip. This brew is an excellent drink to say the least. Not that it’s bad when fresh, however I tend to struggle with it a bit when I have it young. It’s not the easiest to drink in that regard, but now that it has aged for a few years I believe that it has turned into an excellent beer of which I had no trouble downing. I’d recommend trying it for sure if you have yet to do so. If you can pick up an extra bottle and hang onto it for a few years I think you will be quite satisfied with the way it matures. Have you guys tried an advanced aged Stone Imperial Russian Stout? What was your impression? Feel free to leave a comment and let me know.